Not many other U.S. cities can lay claim to sending 31 athletes that represent 11 area high schools to the USRowing Youth National Championships. This is quite remarkable for a city not previously known for the sport of rowing like the dominant coastal teams in the Northeast and the West. This past weekend, the national competition was held in Lake Natoma, Calif., and rowers from Dallas United Crew (DUC) represented 31 of the more than 1,500 boys and girls from 150 crews who qualified to compete on this national stage. 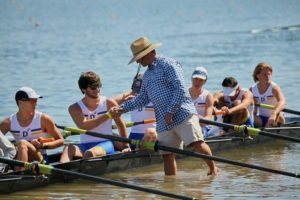 Dallas United Crew sent more athletes than 90 percent of the other clubs in the country, and it was the fourth straight year that the team fielded both women’s and men’s boats to Nationals. DUC’s Men’s 4X finished fourth in the country. What is remarkable about this accomplishment is that this crew just started rowing together in April this year! Three of the four oarsmen will be returning next year to race again — Bryce Miltenberger, Connor Alexander and Andrew Schweitzer. Big brother Will Schweitzer recently graduated and will be attending the University of Texas next fall. The Women’s Varsity 8+ and Men’s Varsity 8+ had top 20 finishes with the lady’s crew placing 16th overall in the country and the men’s crew 18th. DUC’s Lightweight Men’s Crew placed 23rd in the country. Twenty-seven of the 31 Nationals athletes will be returning next fall to compete. For the four seniors, Nationals represents the culmination of four years of hard work and dedication — what an amazing way to close out their high school years. For the Men’s Lightweight varsity boat, it’s a relatively young crew as many of these men, including two freshmen, have only been rowing for two years. It’s great testament to their strength and power to compete at a national level. DUC’s is hosting a free Community Row and Paddle day and TropicSport sunscreen swap on June 16 at White Rock Lake.